Member Centro Interdisciplinario de Neurociencias Univ. de Valparaiso, Chile. Department of Biochemistry and Molecular Biology The University of Chicago. Emeritus Professor, Dept. of Physiology, UCLA. Biophysics of excitation: Structure-Function in Voltage Dependent Ionic Channels and Transport proteins. In voltage dependent channels, the electrical expression of their function is the ionic current which can be studied at the macroscopic level (the ionic current) and at the microscopic level (the single channel recording). But in addition to the ionic current, in these molecules the rearrangement of internal dipoles and charged groups under the influence of the external electric field produce gating currents. These currents are a direct expression of molecular rearrangements relevant to the operation (or gating) of the channel molecule. With the advent of molecular cloning techniques, we have been able to carry out these studies with a detail not possible before by recording gating currents of cloned Shaker K+ and Sodium channels and describing their electrical properties with high resolution. Thus, we can modify the molecule to probe the role of specific amino acids in the voltage dependence and charge movement of the channel. Castillo JP, Sánchez-Rodríguez JE, Hyde HC, Zaelzer CA, Aguayo D, Sepúlveda RV, Luk LY, Kent SB, Gonzalez-Nilo FD, Bezanilla F, Latorre R.(2016). β1-subunit-induced structural rearrangements of the Ca2+- and voltage-activated K+ (BK) channel.Proceedings of the National Academy of Sciences of the United States of America; 113(23):E3231-9. PMID: 27217576 PMCID: PMC4988589. Dang B, Kubota T, Mandal K, Correa AM, Bezanilla F, Kent SB.(2016). Elucidation of the Covalent and Tertiary Structures of Biologically Active Ts3 Toxin. Angewandte Chemie (International ed. in English); 55(30):8639-42. NIHMSID: NIHMS807394. PMID: 27244051 PMCID: PMC5001624. Jiang Y, Carvalho-de-Souza JL, Wong RC, Luo Z, Isheim D, Zuo X, Nicholls AW, Jung IW, Yue J, Liu DJ, Wang Y, De Andrade V, Xiao X, Navrazhnykh L, Weiss DE, Wu X, Seidman DN, Bezanilla F, Tian B. (2016). Heterogeneous silicon mesostructures for lipid-supported bioelectric interfaces. Nature materials; 15(9):1023-30. NIHMSID: NIHMS788971.PMID: 27348576 PMCID: PMC5388139. Barchad-Avitzur O, Priest MF, Dekel N, Bezanilla F, Parnas H, Ben-Chaim Y.(2016). A Novel Voltage Sensor in the Orthosteric Binding Site of the M2 Muscarinic Receptor. Biophysical journal; 111(7):1396-1408.PMID: 27705763 PMCID: PMC5052511. Kubota T, Durek T, Dang B, Finol-Urdaneta RK, Craik DJ, Kent SB, French RJ, Bezanilla F, Correa AM. (2017). Mapping of voltage sensor positions in resting and inactivated mammalian sodium channels by LRET. Proceedings of the National Academy of Sciences of the United States of America. 2017; 114(10):E1857-E1865. PMID: 28202723 PMCID: PMC5347571. Dang B, Shen R, Kubota T, Mandal K, Bezanilla F, Roux B, Kent SB.(2017). Inversion of the Side-Chain Stereochemistry of Indvidual Thr or Ile Residues in a Protein Molecule: Impact on the Folding, Stability, and Structure of the ShK Toxin. Angewandte Chemie (International ed. in English). 2017; 56(12):3324-3328. PMID: 28194851. 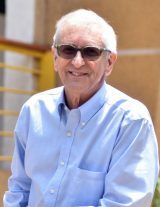 Lee, Elizabeth E.L., Francisco Bezanilla. (2017). Biophysical Characterization of Genetically Encoded Voltage Sensor ASAP1: Dynamic Range Improvement. Vol 113, p2178–2181. Brugarolas, Pedro, Jorge E. Sánchez-Rodríguez, Hsiu-Ming Tsai, Falguni Basuli, Shih-Hsun Cheng, Xiang Zhang, Andrew V. Caprariello, Jerome J. Lacroix, Richard Freifelder, Dhanabalan Murali, Onofre DeJesus, Robert H. Miller, Rolf E. Swenson, Chin-Tu Chen, Peter Herscovitch, Daniel S. Reich , Francisco Bezanilla & Brian Popko. (2018). o image CNS demyelination. Scientific Reports 8:607 | DOI:10.1038/s41598-017-18747-3. Mathur, Chhavi, Kory R. Johnson, Brian A. Tong, Pablo Miranda, Deepa Srikumar, Daniel Basilio, Ramon Latorre, Francisco Bezanilla & Miguel Holmgren. (2018). Demonstration of ion channel synthesis by isolated squid giant axon provides functional evidence for localized axonal membrane protein translation. Scientific Reports 8:2207 | DOI:10.1038/s41598-018-20684-8. Carvalho-de-Souza, Joa˜o L. Bernardo I. Pinto, David R. Pepperberg, and Francisco Bezanilla. (2018) Optocapacitive Generation of Action Potentials by Microsecond Laser Pulses of Nanojoule Energy Biophysical Journal 114, 283–288. Carvalho-de-Souza JL, Bezanilla F. (2018). Nonsensing residues in S3-S4 linker’s C terminus affect the voltage sensor set point in K+ channels. J Gen Physiol. 150(2):307-321. doi: 10.1085/jgp.201711882. Parameswaran, R, J. Carvalho-de-Souza, Y. W. Jiang, M. J. Burke, J. F. Zimmerman, K. Koehler, A. W. Phillips, J. Yi, E. J. Adams, F. Bezanilla, B. Z. Tian. (2018). Photoelectrochemical modulation of neuronal activity with free-standing coaxial silicon nanowires. Nature Nanotechnology, doi.org/10.1038/s41565-017-0041-7.